You can change the projector's Color Mode to optimize the image for your viewing environment. Turn on the projector and switch to the image source you want to use. If you are projecting from a DVD player or other video source, insert a disc or other video media and press the play button, if necessary. Select the Image menu and press Enter ( ). Select Color Mode and press Enter ( ). 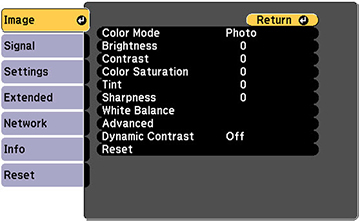 Press the arrow buttons to select a color mode setting and press Enter ( ).